I've previously shared some pics of high elves I've painted as an ongoing, long term commission for a local gaming friend. 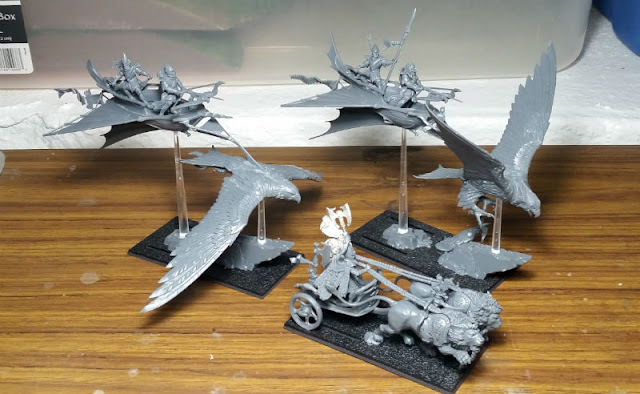 I'll be starting off the year with some interesting additions to that army. As much as I'm a lover of rank & file mass battles, I do still love cool fantasy models. That's part of what sets fantasy gaming apart from historicals, after all. So this will be a fun diversion from all the undead that I've been working on. 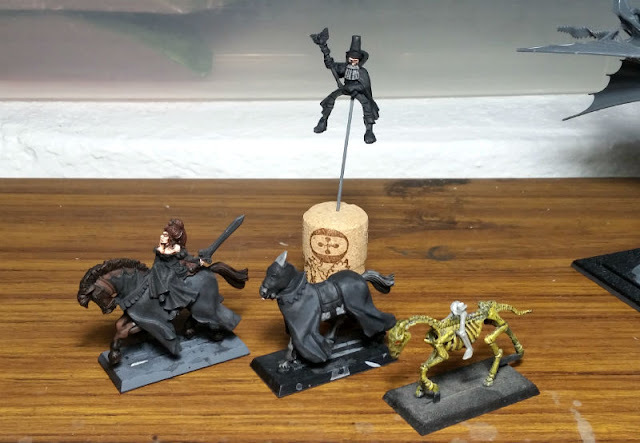 (Finally) finishing two mounted mages for the Marienburgers/mercenaries, and a second mounted undead-necro-whatever. The plan for the latter is to sculpt a hunched figure of tattered robes riding that horse. I've got the lower half of a skeletal rider on there for a guide. Maybe I will leave the feet showing out the bottom. Maybe not. Not really sure how to go about it yet. As for the former two, I need to decide on a color scheme. That's what's largely responsible for holding up the progress for the past few... years. What an awesome conversion, and great painting as well! Not relevant to what I was looking for, but I had to share. Click the link to check out the whole process and more photos. Really looking forward to seeing the High Elves! Those mercenaries look intriguing as well. That conversion is stunning. Some nice looking projects on the table. Interesting link, a lot of good advice for jumping into sculpting.